The Glenn Miller Ballroom in the University Memorial Center (UMC) on the University of Colorado Boulder campus. 1669 Euclid Ave., just off Broadway. Parking: You can park in the Euclid Auto Park, 1725 Euclid Ave., just east of the UMC. Buy and print a $25 parking pass for the week here: https://cuboulder.pmreserve.com/. Hotel Boulderado, 2115 13th St. at Spruce Street. Parking: The hotel has valet parking. Paid street and lot parking is available in the area. We have “courtesy blocks” at the following hotels. They will extend a reduced rate, for a limited time, on an as available basis. After that, reservations are subject to the prevailing rates. We recommend you reserve as early as possible. Where the reception and banquet will be held. Just off the Pearl Street Mall. They have a 12-person shuttle that is free for hotel guests. Bikes available, closest to campus. $179/night (plus taxes) for a standard room. 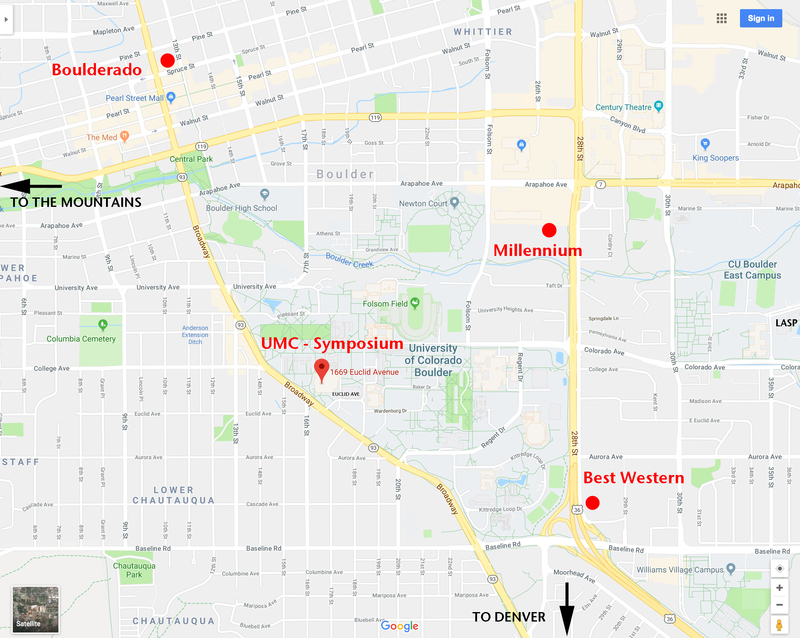 It takes about 45-60 minutes to get from Denver International Airport to the UMC or hotels, depending on traffic. The ground transportation information counter is on Level 5 of terminal, hours are 6:30 a.m. to 11:30 p.m.
To get from the hotels to the symposium, you can walk (up a hill), catch a bus, or Uber/Lyft depending on which hotel you choose. They are all relatively close but ask the hotels for the best option. If you rent a car, you can use the paid parking across from the UMC, and it will be easy for you to enjoy Boulder (see below). There are numerous restaurants within walking distance of the symposium for lunch—either inside the UMC or on “The Hill” across the road. A list of restaurants will be provided. Roam the Pearl Street Mall (near the Boulderado). Shop, see buskers, enjoy Bands on the Bricks on Wednedays night.